The Anaheim Ducks find themselves four points behind the Los Angeles Kings for first place in the Pacific Division. With 11 regular season games left to play for both teams and one more contest against the Kings, the Ducks do have a chance to still win the Pacific Division. Winning the division may not seem like a big deal as it hasn’t translated into making the Stanley Cup Final for Anaheim in the past three seasons. However, this season if the Ducks remain in second place or possibly third place in the Pacific Division, then they will face their other rival, the San Jose Sharks. As the battle for the Pacific continues, the Ducks haven’t decided who their starting goalie will be. Anaheim is in a fortunate position as they have two goalies that they can choose to start. Frederik Andersen has a 20-9-6 record on the season with a 2.17 goals-against average and .924 save percentage. He helped keep the Ducks in every game back in October when the team only averaged one goal a game. The Ducks started to turn things around in November going 6-3-2 before Andersen became severely ill. When Andersen went down John Gibson was called up from the AHL affiliate San Diego Gulls. In December Gibson shined going 5-3-1 with a 1.62 goals-against average, .929 save percentage, and three shutouts in 10 appearances, resulting in being named the NHL’s Rookie of the Month for December. Since December the Ducks have rotated both goalies giving them almost an even number of starts. In the past few weeks coach Bruce Boudreau has been giving each goalie two starts, alternating between them. The strategy has worked so far as the Ducks continued to play well and still have a chance to win the Pacific Division. Boudreau did have to change his schedule with the goalies as Gibson felt ill this past week, which gave Andersen the start against Boston when it was going to be Gibson’s turn. Andersen played one of his best games that night, stopping all 38 shots for the shutout. With just 11 games to go in the season, it’s time for Anaheim to make a decision on who the starter should be in net. Andersen’s last poor outing was back on December 21, when he gave up three goals on 11 shots and was pulled. Since then Andersen has played outstanding going 15-1-2. He leads the league with a 1.77 goals-against average since December 21. He is also second among starting goalies in save percentage at .937 in that time span. In his last 18 games of record, he has held the opponent to two goals or less in 14 of those contests. Andersen has also recorded two shutouts in his last seven starts. His only regulation loss in the past two months came against St. Louis on March 11 when he gave up four goals, but they weren’t all his fault. Three of the goals were scored as the result of turnovers right in front of his net. Besides that game, Andersen has not lost in regulation since December 21. Gibson has played well since December 21 going 13-6-2. His goals-against average was 2.15 during that time span and he had a save percentage of .915. However, in those 21 games Gibson gave up three or more goals in seven of those games. He was also pulled in two games. On January 6, he gave up three goals on 25 shots and he gave up six goals against Pittsburgh on February 8. Andersen hasn’t been pulled in any of starts in the last two months. A big difference comes down to the style of play of both goalies. Andersen plays bigger in net while Gibson is more athletic. The styles work for both goalies, but there has been a noticeable difference in their play. Andersen will give up a soft goal on occasion in a game, but Gibson will give up a goal because he over commits or is out of position. Any goalie, even the best, in the league will give up a soft goal. Being out of position is something more of a concern because it is more preventable. There have been plays like Kevin Klein’s first goal in the game against the Rangers, where Gibson was caught out of position. There have also been times Gibson hasn’t protected the five-hole as well too. Gibson is a quality starting goalie still, but the advantage in the past two months has to go to Andersen, who has been more difficult to beat in regulation. Can Anaheim Go Deep In The Playoffs? Regardless who starts for Anaheim both goalies give the Ducks a chance to win every night, but the concern for either goalie going into the playoffs is the ability to win a close out game six or a game seven. In their last three playoff appearances, Anaheim had four close out game six’s and only won once against Dallas in the 2013-14 playoffs. Anaheim also had three game seven’s in their recent playoff appearances, losing all three. Andersen and Gibson have both been involved in the recent playoff runs. 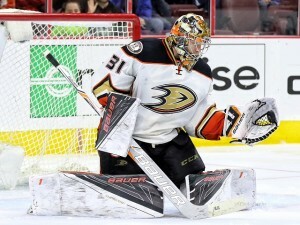 Whether it’s Andersen or Gibson who starts in this year’s playoffs, the starter is going to have to win a game six and possible game seven for the Ducks to go far this post season.